Why your mindset matters in everything you do and how that more than any training style can get you to that next level. 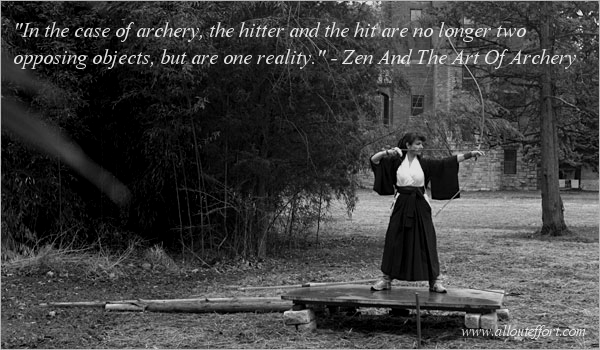 "In the case of archery, the hitter and the hit are no longer two opposing objects, but are one reality. The archer ceases to be conscious of himself as the one who is engaged in hitting the bull’s-eye which confronts him. This state of unconsciousness is realized only when, completely empty and rid of the self, he becomes one with the perfecting of his technical skill, though there is in it something of a quite different order which cannot be attained by any progressive study of the art." This is a line from one of my favorite books, Zen And The Art Of Archery and this book, this line changed my life. In sports, they call it "the zone." That state of grace where everything slows down and you can be perfect. There was an interview of Olympic sprinters and the difference between winning and losing. Fractions of a second make all the difference. So how does one win and one lose? It starts from the beginning of the race, from the sound of the starting pistol. The best runners claimed they never even hear the gun shot, somehow they know to start running simultaneously as the pistol is sounding off. Their mind is at such a state of grace that they are moving in unison with the starting pistol . Their body and the pulling of the trigger is one reality. The best runners said they have no doubt, they know they will win. Leading up to the event they may have doubts but once they are set up on the starting blocks, they now exist in a reality where the start of the race, the sound of the gun, their take off, and their winning has already all happened simultaneously. Most of us live in a reality where we hope good things happen, we hope we succeed, that we hope it will work itself out, but we actually expect the worst. This is a huge part of why we fail. This is an amazing short movie on free climber Alex Honnold. It's over 20 minutes and I know that's long for a youtube video but I promise you, once you start this video there will be no way you can look away. You will hold your breath for the whole duration. Alex Honnold is a special human being who takes hours to climb the faces of cliffs with no ropes. People who do use ropes end up taking days, not Alex. He may be the greatest athlete alive and his mental strength destroys Michael Jordan. When he is alone on the wall, all that exists is him, the wall, and completion. There is a moment in the movie where he is freaking out on the wall and he loses that reality. Without that mindset, nothing seems achievable. With that mindset you are almost super human. Are we so different from such athletes, such winners, such accomplishers such high achievers? Are we that different in upbringing or genetics? Or are we exponentially different in mindset. Not even personality or education but the mindset we can create for ourselves. How come some people can become a world champion in an incredible sport whereas another human being fails at controlling their diet for two days? Are we focusing our energies on the right things? On making our minds stronger, evolving our perspectives, rather than looking for quick fixes and gimmicks? It's about belief. People can be passionate or really want it but if they don't have something they believe in, some reason why they are doing it, it won't last. It will be fleeting. It's not going to happen. I became a Fitness Coach not because I loved fitness, I did it because I believed there are people out there who needed help with their health and I knew I could help them. And I put passion into my work. And it grew. If I was creating the Iphone, and my whole mindset was, I love computers and phones, it would not have been successful. If my mindset was, I want to make a lot of money, it would not have been successful. If my mindset was, I believe I can change the status quo with the Iphone and there are people out there who want to change the world with me, then the Iphone will become successful. And it did, it changed everything. It used to be about the carrier, now it's all about the phone. It seems normal now but that was a huge change years ago. A client said the difference between myself and other people he's met is, I really believe in my people and really want to help them, but more than that, I believe everything I preach. And I do. We don't need belief in superheroes, or to get all cultish about something or someone or hero worship. That's the belief of someone with a weak character. I'm talking about belief in yourself, belief in what can be accomplished, such a strong belief that you and whatever you are aiming for are no longer two opposing forces but one reality. Do this in everything you do, and see what happens. I challenge you.